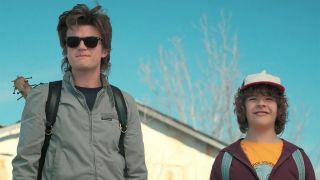 Stranger Things season 3 will have more Steve/Dustin scenes, less Will, and new "forces of evil"
Stranger Things season 3 is pretty much an unknown right now. Other than going back to Hawkins, Indiana with Joyce, Hopper, and the kids, we really know very little. Thankfully, Shawn Levy, one of the executive producers and long-time collaborator on the show, has opened up about what to expect – and, yes, that includes more Steve/Dustin scenes. So, more of that budding bromance is in store. However, not everything will feel quite so familiar third time around. Will, for example, won’t be going through the wringer as much, the poor thing: “We’re going to give Will a break. We’re not going to put Will through hell for a third season in a row. He’ll be dealing with stuff, but he won’t be at rock bottom,” Levy reveals. Change is a-coming. Don’t fear, though, Stranger Things isn’t breaking with its formula – at least in terms of episodes. You can expect “eight or nine” again according to Levy, although there’s going to be a lot to pack in by the sounds of it. While you whittle away the hours waiting for Stranger Things season 3, be sure to check out our best fan theories, as well as why the show (probably) won’t be back until 2019.